By day, six-year olds Connor, Amaya and Greg go to school like everyone else. As night falls, they put on their pyjamas, activate their animal amulets and magically transform into superheroes - Catboy, Owlette and Gekko -- and become the PJ Masks! Australia's hottest new brand for preschoolers, the PJ Masks, are gearing up with super-cat-speed for Halloween! The preschool sensation, broadcast by Disney Junior and ABC KIDS, has taken Australian kids by storm, with merchandise a hit at retail nationwide. Sizes 3-5 years (height range: 95 - 120cm). PJ Masks Glow in the Dark Costumes are available now from Target, online retailers and specialty retailers. adjustable strap for the perfect fit. Assortment includes Catboy, Owlette and Gekko. detailed full-body outfit made of quality fabrics in the character's signature colours. Also included is a fabric mask allowing young fans to enjoy hours of fun as they play out their own PJ Masks adventures. 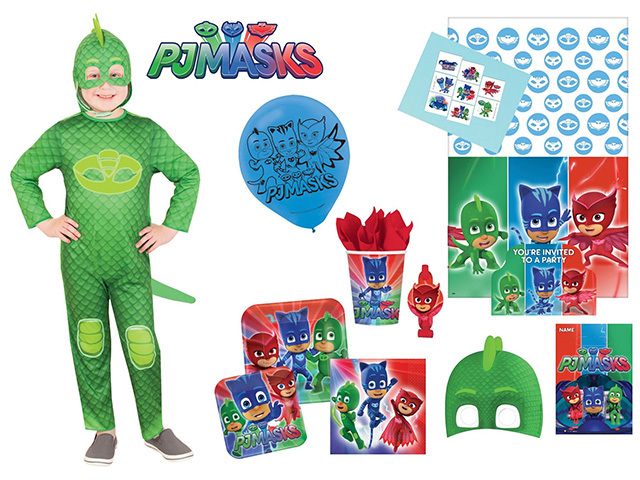 Create your very own PJ Masks Halloween Party, with a gorgeous range of themed party goods, RRP $2.99-12.99. You'll have everything you need for fantastic thrills and chills all around.